Source: Received for an honest review from Net Galley and the publisher. Governed by routine and ruled by duty, Jeffrey had no desire for a wife before he succumbed to Grace’s temptation. Though his golden-haired, in-name-only bride is the definition of disorder, he can’t resist wanting her in every way. But once her secrets meet his, society might consider their lives to be ruined beyond repair…while Jeffrey might just see it as a new beginning. 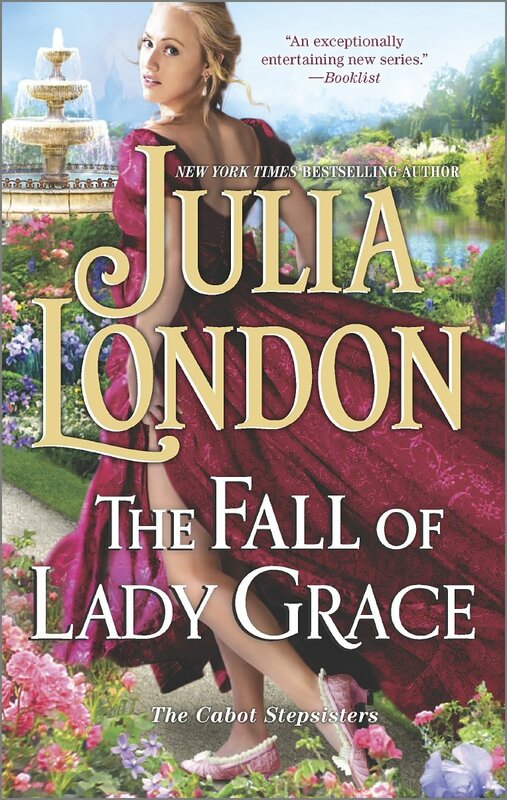 THE FALL OF LADY GRACE by Julia London is a wonderful Historical Romance. A fast paced tale of finding love, scandal, passion, secrets, and finding love after the lies, and secrets. When Jeffrey and Grace are caught in a compromising situation, yes, marriage is next. Grace was actually caught at the wrong time with the wrong man. Loved the way Ms. London, cast flawed characters and made them realistic, enduring and passionate. Jeffrey is ruled by his duty, and routine. Grace is a free spirit, that upsets his routine in more ways than one. A welcome change, with characters who are engaging. A sizzling hot Regency that will have you turning pages and fanning. I can’t wait for the next in the Cabot step-sisters. Received for an honest review from the publisher and Net Galley.